This past weekend I was speaking at a Turning Point USA event in Chicago. During the question and answer session I had a student from Calumet College of St. Joseph’s in Whiting, Indiana raise his hand. His question and his story were so compelling I had him come up on stage. Our young man, Devin, shared the story about how he had been denied his request to start a TPUSA chapter on the Calumet campus because of a lack of interest on the part of the school and the related inability to get a faculty sponsor. We are used to this at Turning Point. Since our inception we have encountered difficulty in having our organization officially sanctioned on campuses across the country. On Friday, March 22, Devin was called in by school administrators to discuss how his efforts with Turning Point were progressing and to gain an understanding of the organization and its role on campus. This is something that just doesn’t happen. Turning Point started almost seven years ago and in that time this example is singular in nature. On the same day that Devin was being called at Calumet to see how they could help him get his chapter started, the dorm room of the TPUSA chapter president at Tulane University was set on fire while his roommate was still inside. Peyton Lofton, the Turning Point student targeted, had recently been “doxed” (had his personal address and information shared on the nternet) along with a Tulane student involved with Young Americans for Liberty. The very next day, police arrested three suspects in the arson attack. Robert Money, David Shelton, and Naima Okami were all arrested on suspicion of aggravated arson. The rapid response and arrest stood in sharp contrast to the way police and campus officials handled a recent violent assault against a TPUSA volunteer on the campus of UC Berkeley. Besides happening on the same day, what do these two completely different events involving TPUSA students have in common? They both took place the day after President Trump signed an executive order that took aim squarely at the checkbooks of colleges and universities that deny free speech to students on campus. Coincidence? I have had people tell me over the past several weeks that President Trump’s executive order was a) Unnecessary (see Tulane story above); b) will have no impact (see St. Joseph story above; or c) have the effect of stifling free speech on campus because there isn’t any real problem (see a therapist). 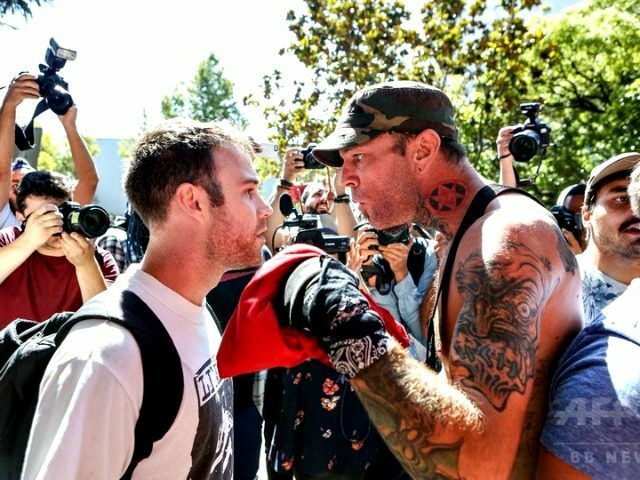 This past February, while volunteering for TPUSA, Hayden Williams was collecting student information on the UC Berkley campus when he was punched in the face by an angry team leftist. The incident was captured on video and went viral in the world of conservative social media. Despite the video, there was little interest on the part of the school officials or local authorities to investigate. Only with extreme pressure from conservative activists did they finally make an arrest. The UC Berkley incident was a political hate crime and it was treated by the university as if it were jaywalking. While addressing an audience at CPAC on March 2, President Trump brought the young Williams up on stage with him and pledged that he would sign an executive order that would allow for a mechanism to punish universities through the withholding of federal funds if they did not protect free speech on their campuses. On March 21 he signed that order. On March 22, well, I already told you what happened on March 22. It was telling at the time the President signed the order that the reaction from universities was almost universally negative. To the uninformed this might seem surprising. Why would universities object to being held accountable for making sure their campuses allowed free speech when that is the primary purpose of an institute for higher learning? To those of us who live inside the world of campus indoctrination, we understood all too well why the universities were complaining. The President’s action placed at risk their primary mission, which is to graduate, or not graduate, tens of thousands of students each year who know only socialism, globalism, and cultural-Marxism to be just principles upon which to organize human activity. Once the President made the CPAC announcement and for the weeks after leading up to the signing, I wrote and spoke as much as I could in support of the action. This was the goal of Turning Point since its inception. The act of arson at Tulane shows the level of hatred that exists inside team left students. The action at Calumet shows that administrations are aware of it. Up until now, the people that run our universities were able to turn a negligent eye to any suppression of rights or acts of aggression taken against conservative students. After the President’s executive order, they still can turn away, but it will cost them.